Just because it's the week before payday and you are reduced to rummaging down the back of your couch for your lunch money doesn't mean that you can't give your skin some TLC. Your kitchen is probably full of cheap and cheerful ingredients that will help you to get your glow on so we're here to help you raid the pantry and create some homemade face masks. Using everyday ingredients can be great for your skin and you’re also getting more bang for your shopping budget buck. I believe that when you know just what you’re feeding your body and skin, the results will show in your glow. I opt for at-home facial treatments packed full of vitamins, minerals and nutrients because I find that they keep my skin super clear. Some masks are great to calm down skin that's been aggravated from eczema or rosacea, and I find that others are great for reducing the appearance of those pesky dark circles. So here are some of my top tips for DIY facials. Before you use a mask, it's important to first exfoliate in order to get rid of those dead skin cells. My DIY exfoliant of choice is a pantry staple that can be found in most kitchens - good old oats. I put a cup of oats in the food processor or blender and blitz until fine. I then mix about tablespoon of the oats with a tablespoon of honey. I use it like a scrub in the sink or shower. You’ll have leftover oats but they’re handy to have in storage for your next exfoliating session (or even to make pancakes). 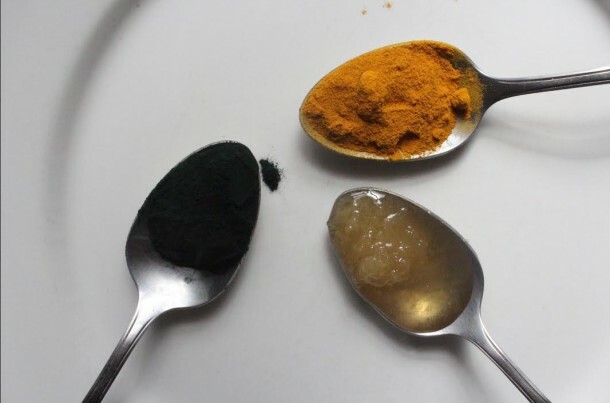 I am a huge fan of turmeric and spirulina powders and I use them in a lot of cooking recipes. Scooped into curries or smoothies, they're packed with several essential nutrients and vitamins. But when it comes to beauty, I mix together a tablespoon of either tumeric or spirulina, one teaspoon of honey and one teaspoon of Greek yogurt. I start with a clean, damp face, rub on the mask and leave for about 20 minutes before rinsing to reveal brighter looking skin. But be careful of your clothes as the spices do stain. Another mask involves my favorite spice, cinnamon. I found myself using this mask in the wintertime on those cold nights as cinnamon promotes circulation and blood flow (but be careful with how much of it you use - experience tells me that you can easily find your face getting a little warm). I mix half a teaspoon of cinnamon with one teaspoon of honey. Leave on for about 15 minutes and then rinse. Are you a fan of DIY facials straight from the kitchen presses? Do you have any tips to share? We'd love to hear them in the comments below. You can read more from foodie and writer Carmel Hall on her blog, www.cookinwithcarmel.com, where you'll find all her recipes, both sinful and saintly. Or check her out on Instagram, Twitter and Facebook.